Throughout American history, “100 days” has marked a critical benchmark for any new leader. 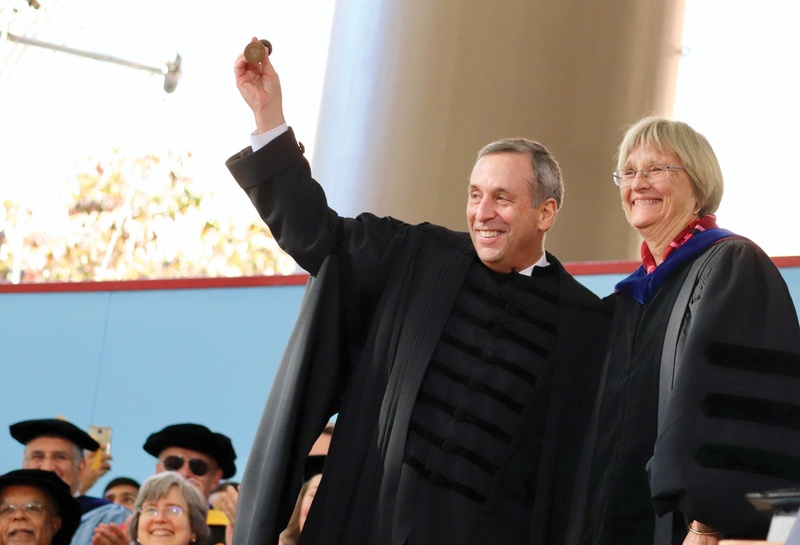 The Crimson looks back on University President Lawrence S. Bacow's first months in Harvard's — and arguably, higher education's — top job. In University President Lawrence S. Bacow’s office in Massachusetts Hall, the furniture is still rented, the walls still bare, and the photos still unframed. It’s clear the space is still adjusting to its new occupant, but Bacow’s demeanor suggests he already feels at home. Bacow, who marks his 100th day in office Tuesday, has only just moved into the corner office. He was officially inaugurated Friday in Tercentenary Theatre as the University’s 29th president, a role for which he was chosen in Feb. 2018. The celebration fell three months into Bacow’s tenure — and in those three months, he has already begun advocating for higher education, socializing with students on campus, and absorbing the intricacies of the University’s inner workings. Throughout American history, “100 days” has marked a critical benchmark for any new leader. Celebrated Harvard alumnus President Franklin D. Roosevelt, class of 1904, popularized the term the during the Great Depression, when he pushed through Congress an ambitious plan to right an economically struggling United States in just over three months. The situation Bacow inherited is not nearly so dire. Harvard just closed out a $9.6 billion capital campaign, saw improvements in its endowment returns this year, and receives more applications for undergraduate admissions each year. It won’t be all smooth sailing for Bacow, though. Soon after he reaches 100 days in office, a high-profile lawsuitalleging Harvard discriminates against Asian-American applicants will go to trial in a Boston courthourse and Harvard will need to shell out money to the federal government to pay an unprecedented tax on its endowment — all that on top of a political climate that is decidedly hostile tohigher education. Once on the job, Bacow wasted no time getting out into Harvard Yard, greeting freshmen during Opening Daysand helping carry boxes during First-Year Move-In in August. Harvard’s public relations apparatus ensured his presence was documented; pictures of Bacow and his wife, Adele, popped up across Harvard’s social media outlets. Bacow took selfies with new students, chatted with their parents, and met with first-generation students enrolled in a new pre-orientation program. An avid runner, Bacow has adopted many new ways of interacting with students, including jogging with them along the Charles River and up to Elmwood, the presidential residence. Despite Bacow’s enthusiastic presence at University-organized events, social life remains a contentious topic on Harvard’s campus. Bacow inherited the College’s controversial penalties against single-gender social organizations when he agreed to take on Harvard's top job. In 2016, tormer University President Drew G. Faust announced the sanctions, which — starting with the Class of 2021 — bar members of single-gender final clubs and Greek organizations from holding student group leadership positions, varsity athletic team captaincies, and from receiving College endorsement for certain prestigious fellowships like the Rhodes. Bacow said in September that the sanctions are here to stay, eliminating any doubts that a change in leadership would mean a change in policy. Bacow emphasized that the sanctions embody the College’s values of inclusion and belonging. “I’m still, as a new president, getting to know and understand sort of the impact of our policies and how it’s affecting folks,” he added. In evaluating social life at Harvard, Bacow said many students have told him that the College has “ceded social life to private unregistered organizations,” which, for him, justifies the sanctions against single-gender social groups, many of which own private, off-campus mansions and answer to graduate boards. Whether that means more events with thousands of catered lobsters or Mediterranean buffets — like those the College held in the first weeks of September — remains to be seen, but Bacow said he has been looking for “opportunities to engage” and “will continue to do so.” On his list are athletic events, intramurals, and meals in House dining halls. But even as he’s taken time to socialize with students, Bacow also hasn’t been afraid to assign some homework. Joining campus organizations, politicians, and celebrities across the country in calling for American citizens to vote in the November midterm elections, Bacow has insisted that students on campus register to cast ballots in the upcoming races. In his first-ever Convocation address, Bacow asked students to take out their phones and write down an Institute of Politics website that helps students register to vote and request absentee ballots from their home states. Last week, Bacow took his message to the entire school. In an email to students bearing the subject line “Democracy,” Bacow again urged students to exercise their civic duty. “In five weeks, Americans will head to the polls for the midterm elections and fulfill the first responsibility of citizenship in a democracy,” Bacow wrote. Bacow’s message to students regarding civic engagement ties into his efforts to combat the hostile political climate facing higher education. In his first hundred days, he has followed in the footsteps of his presidential predecessors, making the case for higher education in Washington and around the country. Public opinion regarding institutions of higher learning has soured in recent years. Colleges and universities have taken several political hits since the start of the Trump administration, including terminations ofprotections for undocumented youth, a Republican-driven tax on university endowments, and criticisms that higher education is not open to all views across the political spectrum. On top of that, a high-stakes lawsuit filed in 2014 alleging Harvard discriminates against Asian-American applicants has garnered support from the Department of Justice, which filed an amicus brief in August that supports the plaintiffs’ claims that Harvard engages in illegal racial balancing in its admissions process. “One of the reasons why I’m spending as much time as I am in D.C. and will spend it there but also traveling around the country, engaging in conversations with others, is because I believe so passionately in the mission of higher education,” Bacow said. The new partnership wasn’t his only effort to reach beyond New England; he also visited his hometown of Pontiac, Mich. last month to speak to students about college and financial aid opportunities at schools like Harvard. Bacow encouraged students to pursue higher education. He also tried to combat stereotypes that institutions like Harvard only serve coastal elites. “There’s a perception at least in parts of the country that only people who attend Harvard or only people who live nearby places like Harvard benefit from what we do,” he said in an interview during the trip. Bacow said he plans to embark on other travels around the country in his quest to combat Harvard’s image problem and change what he considers misperceptions about higher education. Harvard has come under fire in recent years from those who say it doesn’t support students who want to pursue careers in public service. In his inauguration speech, however, Bacow committed to financially supporting every undergraduate who seeks a summer position in the public sector. From Harvard’s campus in Longwood to the Kennedy School along JFK Street, the University’s schools have welcomed Bacow with open arms. At the Kennedy School, where Bacow spent years as a graduate student, posters with the new president's face line the walls of the newly renovated complex. In an interview Thursday, Kennedy School Dean Douglas W. Elmendorf said Bacow’s selection marked a particular point of pride for the school, which has never before seen an alumnus assume Harvard’s highest job. “He knows a lot about Harvard and is committed to Harvard serving the students who come here and serving the broader world that we're a part of and that view of President Bacow fits very well with the mission of the Kennedy School,” Elmendorf said. Across the river in Longwood, Michelle A. Williams, dean of the School of Public Health, said she was equally “delighted” byBacow’s selection. Though Bacow has plenty of plans, he said he’s still learning the ropes. When he was first appointed in February, Bacow told The Crimson he was in “sponge mode” — meaning he would learn as much as he couldabout how to be Harvard’s president in the months before he officially took office. One hundred days in, Bacow said not much has changed — and he doesn’t expect to stop listening and absorbing information any time soon. —Staff writers Alexandra A. Chaidez and Luke W. Vrotsos contributed reporting.